SamuiBus.com | Book transfer from Bang Rak Pier just a few minutes! Koh Samui’s stunning Bang Rak Pier beach is 4km long with white sands and clear blue water; adjoining the popular north-eastern corner. 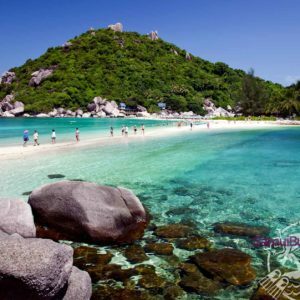 The BangRak beach is known for its excellent scenery and lively parties. Bang Rak Pier is the closest point to Koh Phangan’s Full Moon Party; so it has become a popular accommodation spot, especially among Full Moon Party guests. However, the beach is quite serene and laid-back in comparison to the other beaches in Koh Samui. The first line of the BangRak beach occupied by the private villas, bungalows and sea view restaurants. Larger hotel complexes and comfortable villas could be found above, in the hills of Bang Rak, which offers breathtaking views of the coast and the landscape of the Samui airport. Fans of a plane spotting will like this place: taking off and landing aircrafts can be seen in all its glory! Get from the Bang Rak Pier to the hotel and back will be so easy if you will think about it in advance. Just book Transfer service!